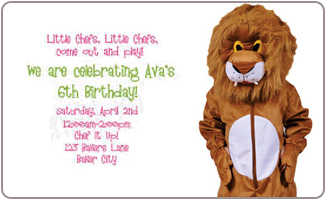 Take a walk on the wild side with a zoo birthday party that is sure to be a roaring good time for all. Lions, tigers, bears, oh my! 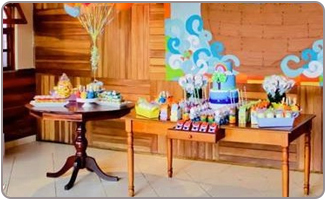 There are lots of great zoo and jungle party ideas that will ensure your party goes off without a hitch. Throwing the zoo party at the actual zoo is one of the best jungle party ideas you could come across. Of course it can sometimes be a bit on the costly side to take a large party to the zoo so be sure to find out about group rates and other available discounts. A local park is a good choice for your zoo birthday party festivities. Many neighborhood parks have picnic tables, covered pavilions, and plenty of space for the kids to run and play. Bring the zoo and the wild to you by hiring a petting zoo to come to your home. You may not get the big cats and crocodiles, but the kids can still interact with tarantulas, pythons, and other great wild animals. Transforming your backyard into a wild jungle or zoo is a good budget-friendly choice, also. With a bit of creativity and a Zoo inspired theme like Jungle Safari Party Supplies, you can set up a safari expedition in your very own backyard. Encourage guests to dress up as park rangers or explorers, complete with binoculars and pith hat. Start planning the zoo party at least 6 weeks in advance so that you can get bookings for locations done on time, and so that you have plenty of time for your animal themed party supplies to arrive. For your wild jungle theme party you can pick up a few packages of preprinted Jungle Safari party invitations and thank-you notes that will not only fit in perfectly with your animal zoo birthday party theme but will also save you a bit of time in your preparations for the party. 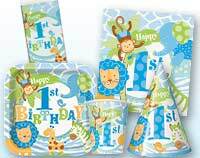 With a zoo party you have numerous choices to create your own invitations. Pick your child's favorite wild animal and fashion an invitation after that animal. You could use felt glued to cardstock to create textured cards, and crafting feathers to get the vivid look of a jungle parrot. A safari jeep fits in nicely with the jungle theme party. Cut out the shape of the jeep and embellish using markers and die-cuts of animals. 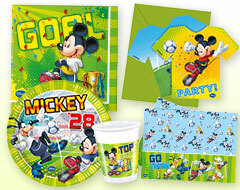 This is a great option if the party is being thrown for a birthday boy. If you plan on hand-delivering the invitations then a small plush jungle animal will be adorable attached to the invitation. A keychain is another option to attach to the invitation. A pith helmet or a pair of binoculars make a great invitation for the party, and could include catch zoo-related phrases like "Explore the wilderness at the Smith's Zoo for Jane's jungle bash!" Another exciting idea is, let your child be dressed in costume of his/ her favorite animal, For instance Lion and paste this picture on the cardstock invitation. This is the simplest and cutest way of introducing your guests to the party theme. A backyard safari or exploration adventure will keep the kids scouring the yard for sightings of their favorite wild animals. Hide plastic zoo animals and a few plush animals around the yard, and give the kids a list of the animals they might spot. A scavenger hunt is sure to keep the kids playing for a good long time. 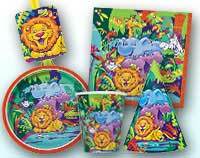 Offer zoo themed prize packs to those who complete their hunt lists. Pin the tail on the zebra or the elephant are fun spins on the classic pin the tail on the donkey party games. 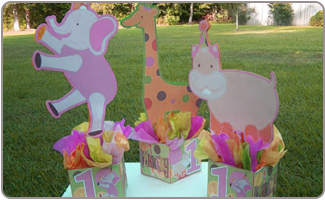 A zoo themed pinata, perhaps a Zebra, Lion or a Monkey, will be a lot of fun for the kids to take turns bashing. 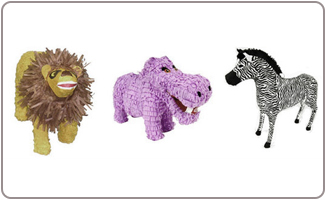 Fill the piñata with delicious candies and zoo-themed toys. A good-natured trivia game can let the kids show off their vast knowledge of zoo animals. Keep the questions easy and have lots of prizes on hand. 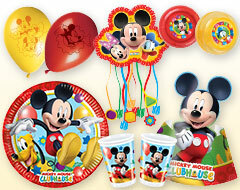 Some jungle party ideas for return gifts could include jungle safari blowouts, whistles, tops, and even bouncy balls. A selection of candy and cookie sweet treats offer snacks for later. Coloring books and stickers, along with temporary jungle-themed tattoos offer a creative choice. Sunglasses and binoculars, along with zoo-themed socks or hats are sure to be a lot of fun. Girls love to get lip gloss and beaded jewelry. The little guys will enjoy their plastic army men, dinosaurs, cars, squirt guns, and plastic zoo animals. A tropical punch in a large punch bowl can resemble a jungle swamp that is cool and refreshing! Add frozen grapes, gummy worms, and other gummy bugs frozen in ice cubes. A floating plastic green alligator will give the swamp that scary edge! If the party is being hosted outdoors, a few burgers, hotdogs and skewered meats and vegetables make great zoo party fare. Smoked turkey legs, nachos, and cotton candy are also fun favorites at the zoo. Offer a nice selection of fresh fruits and vegetables, perhaps with a sweet cream dip and some hummus for the vegetables. 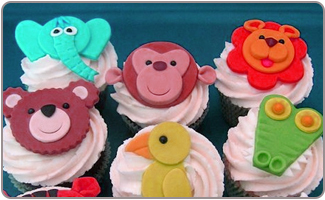 Cupcakes and cake pops decorated like wild animals will be a hit with everyone. A large sheet cake or a cake sculpted like your child's favorite wild animal will be the crowning centerpiece to the event. 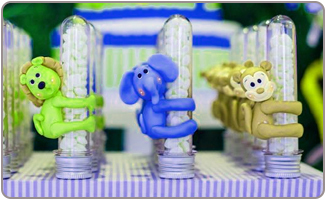 Decorate the cakes with zoo party themed cake toppers. Deli sandwiches cut out with cookie cutters in the shape of zoo animals are sure to please even the beastly appetites. Lettuce wraps are a popular choice for kids who love to fix their own plates. Offer lots of chicken, vegetables, and large lettuce leaves for wrapping. Chocolate covered banana slices are just what every little monkey wants at a zoo birthday party! Transforming your backyard into a jungle might be easy if your yard is already lush and green, but if it isn't then you can use inflatable trees and silk plants to add a much more jungle feel. 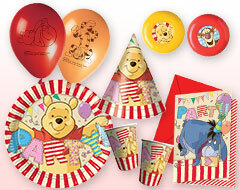 Party balloons including latex balloons are a must have for any party, and can be easily paired with Mylar balloons in the shape of your favorite zoo animals. Get a nice selection to complete the wild look. Colorful balloon bouquets are easiest to make and add zing to the party decorations. 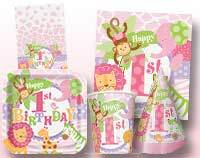 Wall posters, vinyl clings, streamers, and a large birthday banner will add a festive vibe to the party room. Grass hula skirts can be used to transform a table into a grassy savannah. Simply tape the grass around the table and cover the uppermost part of the table with a beige-colored tablecloth. Create a centerpiece for the table that includes some of the things typically found at the zoo and on safari adventures. This could include binoculars, a pith helmet, and a selection of plush or plastic wild animals. Use several large cardboard boxes, paints, and markers to create a safari jeep that can be used for the kids to pose in for pictures.